Lawrence Station underpass was a welcome addition, for the most part. It takes time to find the best route to work, and experimentation. You’ll never know if a route is good unless you try it. It took me more than a decade to settle on the ideal route to work in the area of Kifer Road and Lawrence Expressway in Santa Clara. 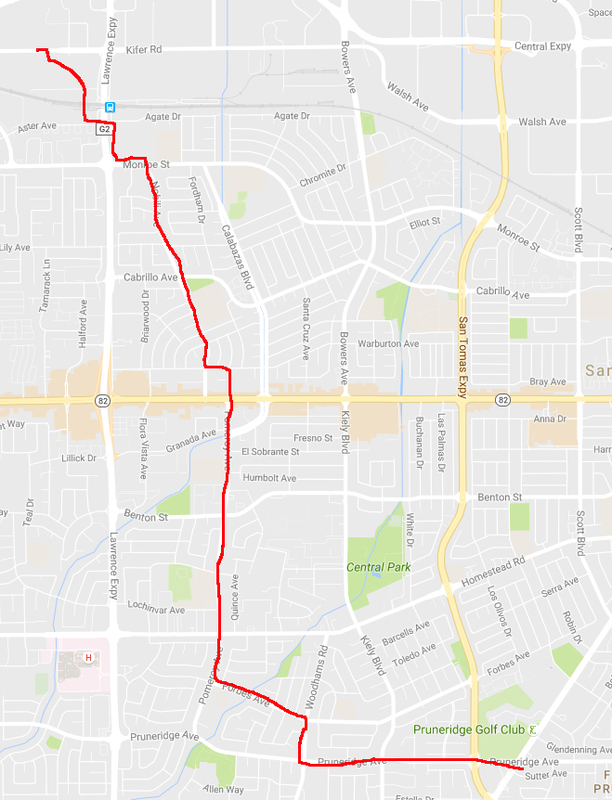 The route has changed in part because I got tired of dealing with the Caltrain railroad tracks. Early on I tried taking Kiely Boulevard north from Pruneridge. If ever there was a road to avoid, Kiely is it. It’s bumper to bumper traffic, lots of stop lights and downright miserable riding. I quickly gave up on that option. I then settled on Pomeroy Avenue (bike lane), jogging left on Warburton to Nobili Avenue (light traffic) north to Monroe Street. I’d take a left onto Monroe (no stop light so it was a chore) and pick up a frontage road, French Street, next to Lawrence Expressway. Today there’s a massive apartment under construction at the Lawrence/Monroe intersection. However, I had to walk my bike up stairs and down stairs on a Caltrain overpass. It was a big pain. Once the Lawrence Station was remodeled in the early 2000s, I could take the underpass, although bikes must be walked through the subway. Another issue cropped up when going home by that same route. I cut through an office complex parking lot to get to Nobili. Eventually I couldn’t cut through the parking lot when it was closed off, so the route home no longer appealed to me. French Street is one-way going north. I also tried out Willow, Monroe, Timberpine, Halford Avenue, Benton, but it took me out of my way and the roads are congested from high-density housing on Halford. Next I’ll discuss San Tomas Expressway and how I rode it daily for many years. This entry was posted on July 31, 2016 at 11:29 am and is filed under Commute Adviser. You can follow any responses to this entry through the RSS 2.0 feed. You can leave a response, or trackback from your own site. I used to live on Warburton between Pomeroy and Nobili, so you must have regularly ridden right by my house. Funny.